If you are one of the over 8 million Americans suffering from degenerative spine conditions, you know that the pain can be crippling. Spinal Stenosis Syndrome and Degenerative Disc Disease can cause severe back, leg and arm pain that leaves you struggling to make it through the day. What exactly is happening to your spine that leaves you in so much pain? Our spinal discs are soft tissues separating the vertebrae that make up our spine. They act as shock absorbers, so the movements of everyday life won’t damage our vertebrae or our nerves. As our bodies age, our spinal discs degenerate. Our body’s reaction to the degeneration is to grow excess bony tissue, in an attempt to maintain the stability of the spine. Unfortunately, this tissue can put pressure on the spinal cord and nerve roots. The result: pain and loss of functionality. 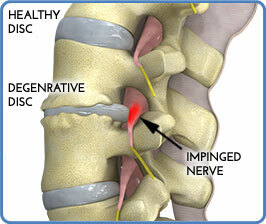 This condition is known as Degenerative Disc Disease. Your vertebrae create a circular spinal column with space for the spinal cord and the surrounding spinal nerves. Sometimes, however, the space within the spinal column can narrow. This can happen due to aging, bone or tissue growths, arthritis, or slipped vertebrae. The narrowing is known as Spinal Stenosis, and the end result is that your spinal cord and the surrounding nerves are pushed, pressured and pinched – causing you back pain, often severe in nature. 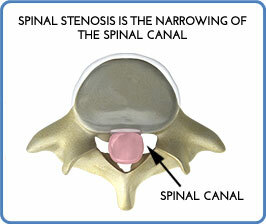 75% of spinal stenosis cases occur in the lower back, which can cause severe pain in your legs in addition to your back. Depending on exactly where your spinal cord and nerves are affected, you might also experience falling, clumsiness, mobility issues, or sensations in your legs such as numbness, tingling, or hot and cold feelings. What is spinal decompression surgery and when is it considered as a treatment? If you’re suffering from severe back pain, your medical practitioner will likely advise conservative treatments such as physical therapy, pain medication or spinal injections to block the pain or reduce inflammation. If none of these treatments work, spinal decompression surgery becomes the only viable option for pain relief. Spinal decompression surgery is the removal of the tissue, e.g. bone that is putting pressure on your spinal nerves. With the pressure relieved, the pain stops. Sometimes, in order to get to the tissue that is putting pressure on the nerves, the surgeon needs to remove some of the surrounding spine tissue which is needed for the stability of the spinal column. In these cases, the surgeon will restore the needed stability with a Spinal Fusion Procedure. Grafts or implants are used to connect (fuse) the damaged vertebrae. Is there any way to avoid the need for additional procedures like Spinal Fusion? Carevature’s goal is to make it as easy as possible for you to recover from spinal decompression surgery. To that end, we’ve developed Dreal™: the first and only miniaturized, powered and curved device suited to the spinal arena. 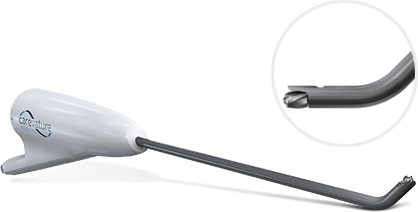 The curve enables surgeons to access the spinal area they need to reach easily, without removing extra bone and tissue on the way. Less tissue removed means less damage to the structure of the spine. If pain medicine, physical therapy, and other conservative treatments haven’t helped your back pain, spinal decompression surgery might be the solution for you. When your medical practitioner refers you to lumbar, cervical or thoracic spinal decompression procedures, the Dreal™ system can present a safer, less traumatic surgical solution. Ask your doctor about Dreal™ for more information. Or read more about: Spinal Stenosis, Degenerative Back Conditions and Common Back Pain Conditions.